I’m not editing anything here…just came home for dinner and decided to post a quick remembrance of the visit to the Bow River after teaching today. I thought I was looking at another flock/murmuration? of European Starlings, but what I was looking at was a tree full of Bohemian Waxwings. 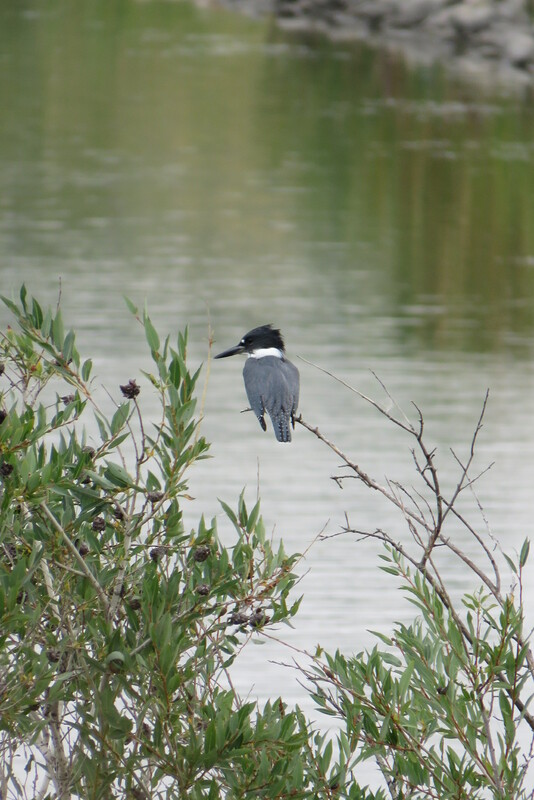 I was really pleased because apart from a couple of sightings at the pond, this one is uncommon for me to observe. The grey of late afternoon made everything visually flat, a most difficult atmosphere for photography, but it certainly didn’t stop the drama of absolutely everything at the river. It makes me so happy to see that there is a huge melt going on right now and there are some habitats beginning to reveal themselves. I’ve seen so many stunningly unbelievable photographs published by birder/photographer friends of Bohemian Waxwings that I am a bit embarrassed to post my very best. And of course this little guy had to show me his very best side, didn’t he? Once again, I enjoyed the sound of the male pheasants gobbling from above the ridge and saw them strutting about, their brilliant red and green, signature colour, on the otherwise grey-gold hill. There were the Crows caw cawing…the Robins perching…the Northern Flickers dancing and calling…and the Common Golden Eye males doing their hilarious back bends to impress the females who looked both bored and disinterested. But…the most amazing thing I saw today was first, to see all of the gulls lift off the snow pack in unison, at the river’s edge. 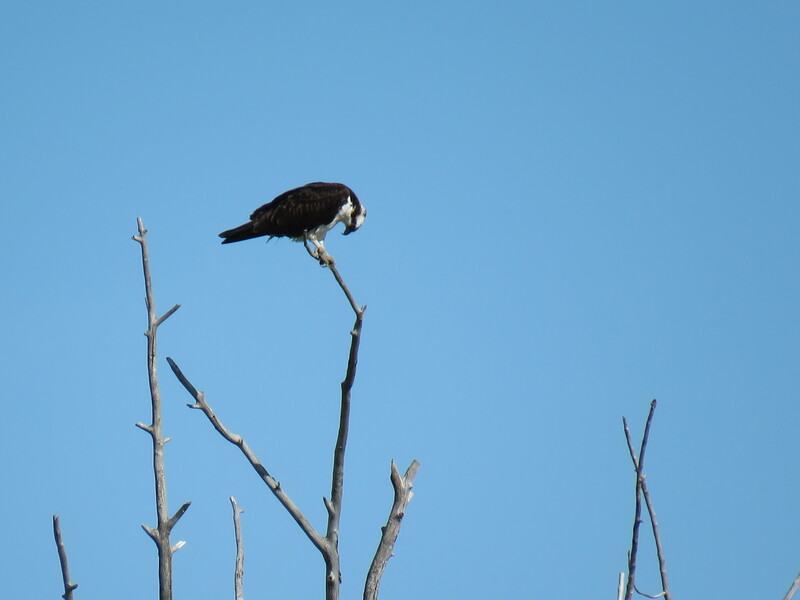 Gazing across the river, I surmised that one of the Bald Eagles was fishing and so I looked across…not above. Oh my goodness! There, flying directly above my head and only meters away, was one of the Juveniles, on a serious bird hunt! I don’t know how to pan or how to focus on a moving target, so none of it came out as a well-told visual narrative. I guess that’s why I’m writing. I could cry right now, it was so bloody amazing! First…a loud cacophony of gull sounds and whoosh…they lifted up. This is all that my camera picked up…but, I will remember. I decided to stand there and watch. By this time, another bird watcher had joined me on the bridge. I asked him if he had witnessed what I just did and he acknowledged the magic. I thought that, for certain, this juvenile was looking to eat and that we should be prepared for the next spectacle…instead, something more amazing happened. From seemingly nowhere, this guy arrived. He’s been protective of the nest and a very supportive partner. Mrs. has been sitting on eggs through the past ten or so days, enduring horrible winter temperatures and lots of snow. The two adult Bald Eagles have been working together beautifully and I’ve watched the delivery of several lovely big fish. 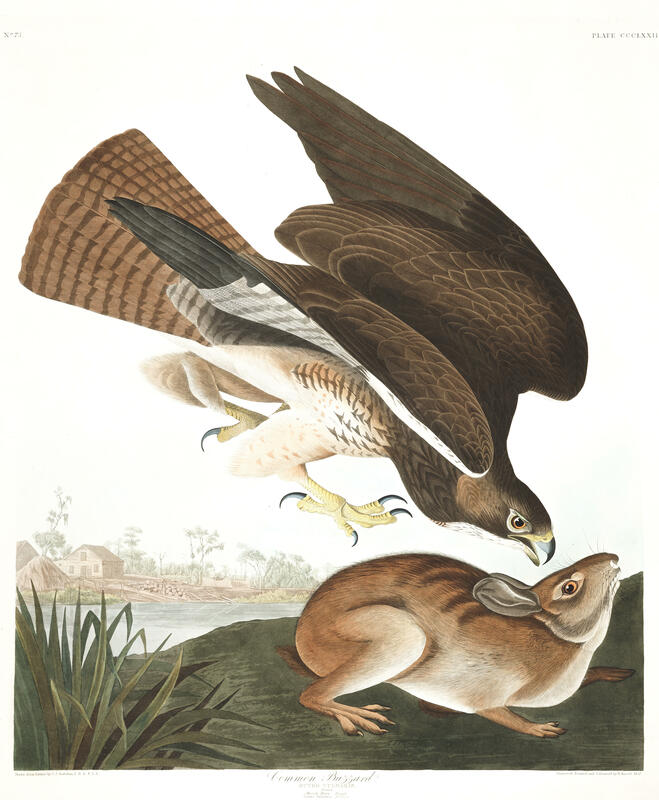 He swooped out and over the river and aggressively bolted toward the juvenile, who then also lifted off, heading north on the river. 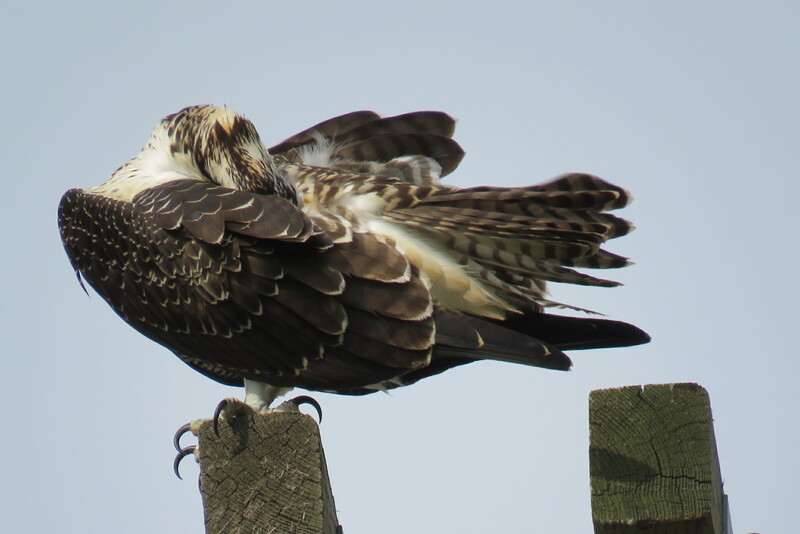 The adult, angry, bolted at its rear, wings on both, flailing this way and that…it was beyond exquisite! Those of us who saw this all unfold were in awe and squealing in delight. There is a very good chance that this two year old is the adults’ own progeny. Once raised, I believe the adults do not accept their youngsters back. It is brutal, but a fact of nature. There are the next babes to protect and raise up. This young fellow is on his own. 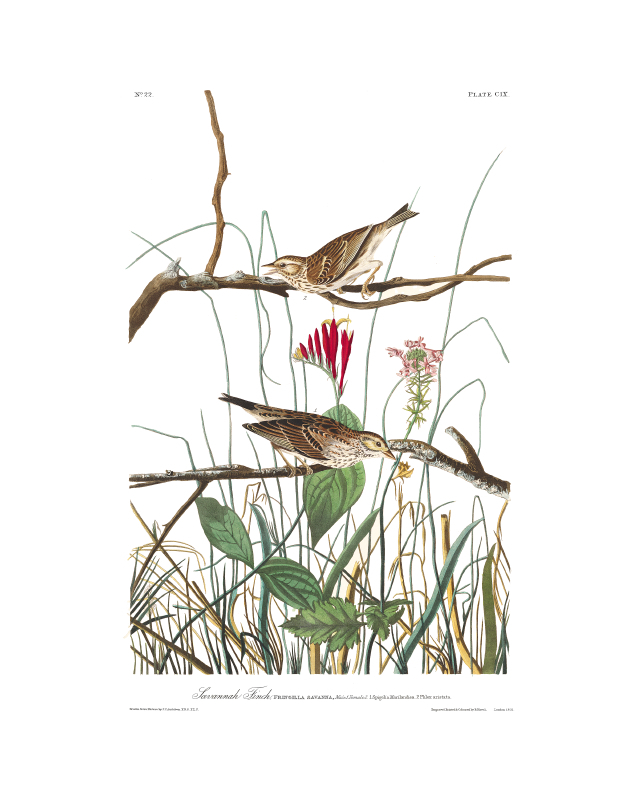 A young bird’s first flight typically is not very far, and fledglings are reluctant fliers. Landing is a skill that takes practice. They may stay at their first perch for a few days before flying again or even spend time on the ground where they’re vulnerable to predators. 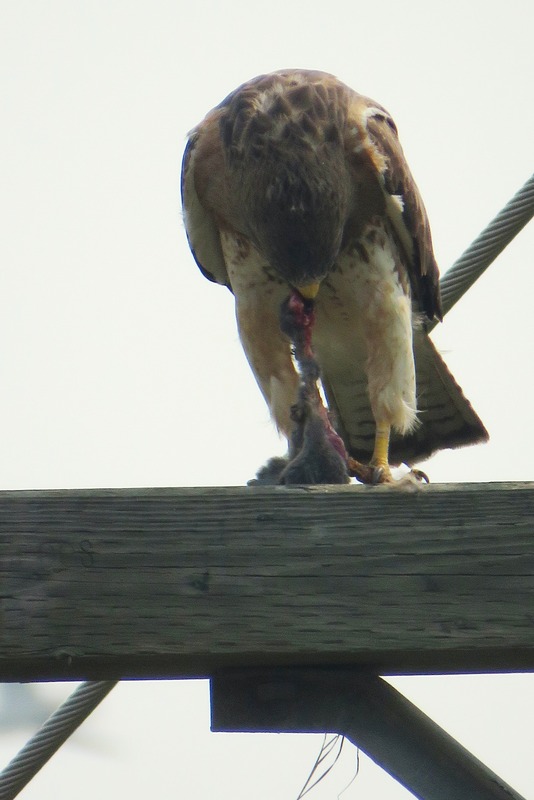 Adults will continue to bring food to the young bird outside the nest as long as they know where the fledgling is. Adult birds are tied to their fledglings, not to the nest, so they will tend to their young wherever they are after fledging. A parent eagle’s job doesn’t end at fledging, however, and if the post-fledging care is included in the nesting cycle the length becomes closer to 5.5 or 6 months. Fledglings may continue to rely on their parents for food and other care for 4-6 weeks post fledging. 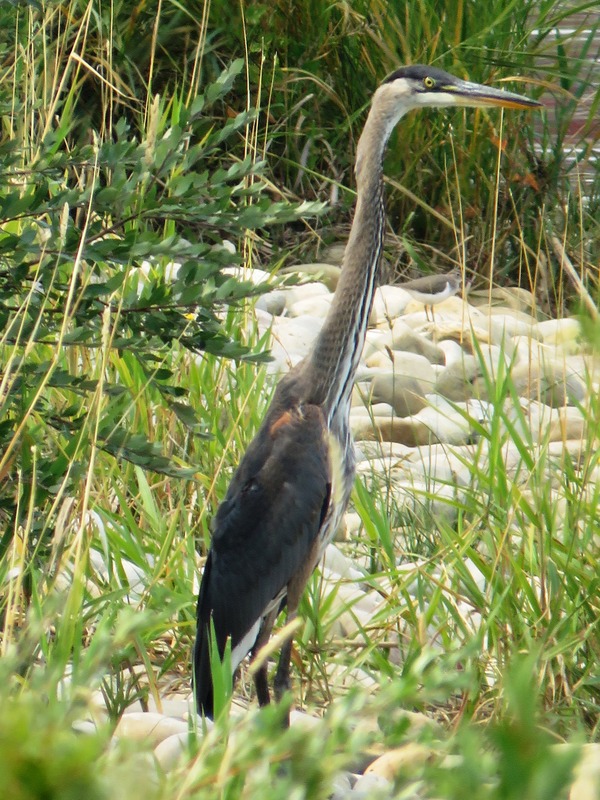 In most cases, parents continue to deliver fish and other prey to the young birds until they learn to forage on their own, which occurs between four and 10 weeks after leaving the nest. This stage is a very vocal time for the eagles as the adults and young call frequently to locate each other for feeding and security. In more remote nesting areas the adults would stop bringing food into the nest for the returning young birds. Instead they would make sure the young birds would see them feeding so they would come to take the food and the parents would simply back off. 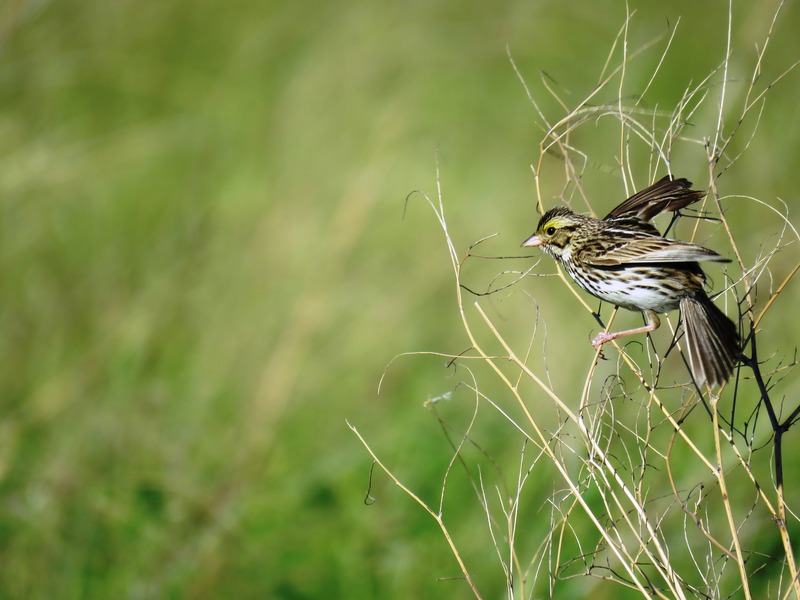 Adult parents will continue to provide food for some time after fledging, while the newly flighted birds hone not only their hunting skills, but their flying skills. On average, it takes about 4-12 weeks for young eagles to start hunting successfully. Specialized hunting skills probably take years to develop. Fortunately, their parents fed them well in the nest, so most fledgling eagles have some reserves when they fledge. 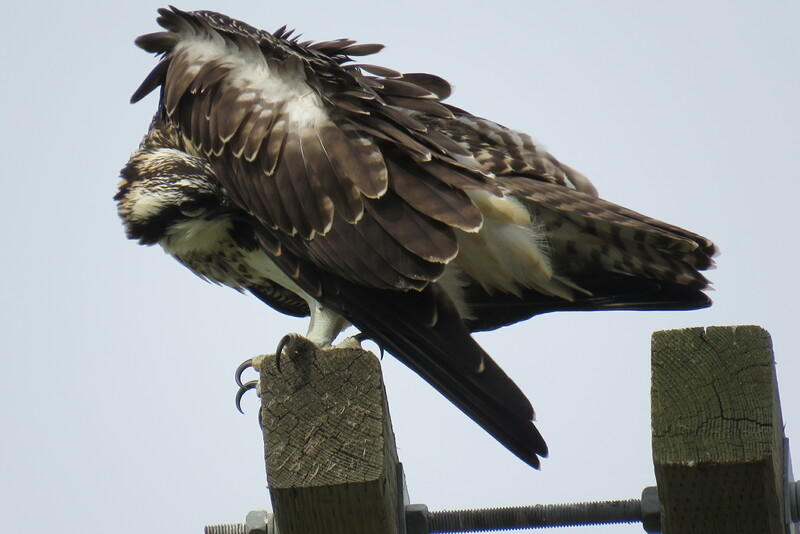 The eagles usually remain near the nest area through much of summer, however, 7 to 8 weeks after fledging, they may start to move further distances. Once the young eagles are able to find food on their own (usually in early fall), the parents go their separate ways and remain solitary until the following breeding season. 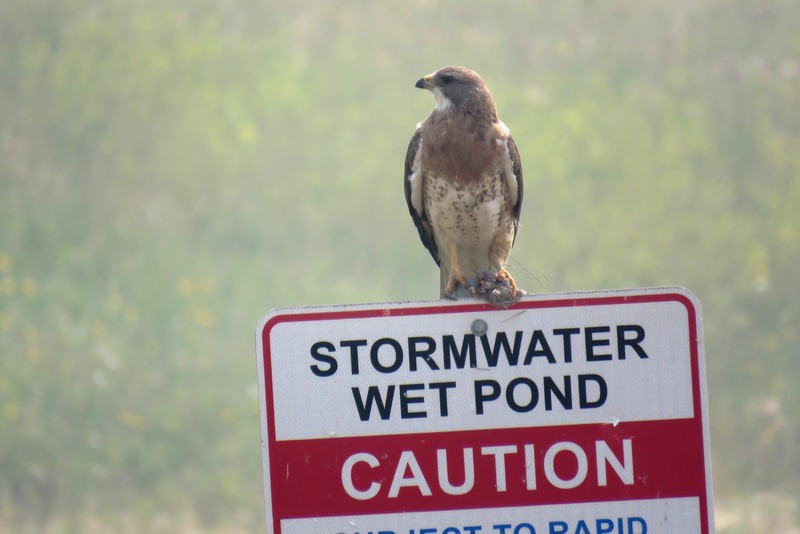 If the eagles of the area migrate, they may start migrating. If the eagles do not migrate, they may just move to an area that has more food. Juvenile eagles travel for the first four years of their lives. They wander great distances in search of food. During the first year of life, eagle mortality rate can be more than 50%. One year out of the nest their survival rate is much higher. There was magic to be found at the river today. I shouldn’t always apologize for my photographs. 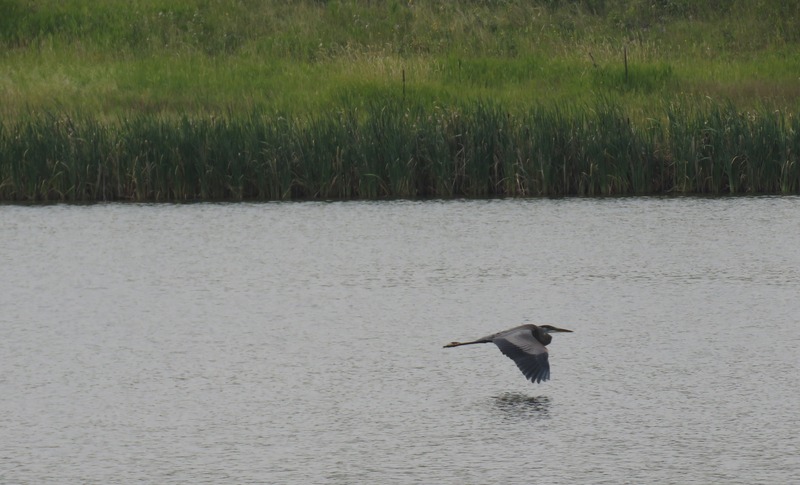 I’m not in the business of circling a single pond for the possibility of becoming a photographer, but I would like it if the images were focused. I am walking daily, however, in order to document what I feel, see, hear and experience. I am there to learn and to discover through all of my observations. Well, today, I saw one single male Northern Pintail duck on the pond. 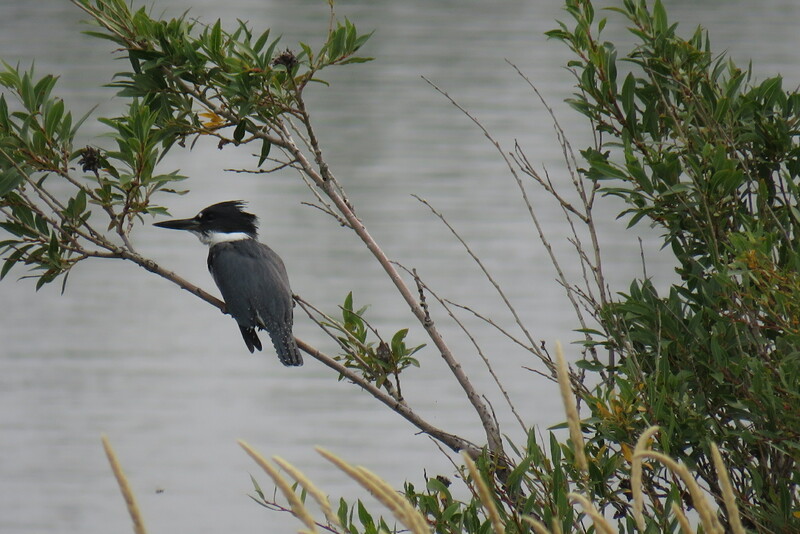 While a very common bird, I have never seen one and I’m always excited to spot a new species. I find it funny that I’ve observed such a variety this autumn and usually solitary male birds. 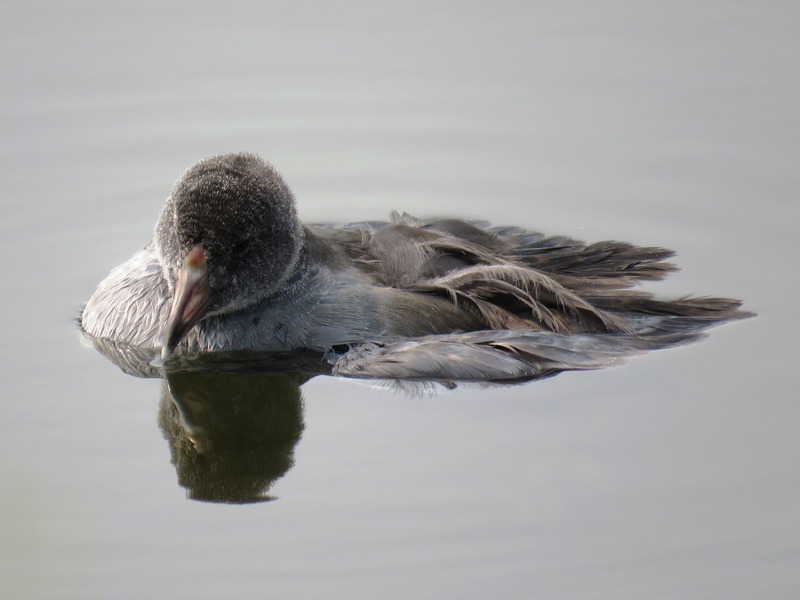 Please enjoy the link to the Northern Pintail that I have provided. It doesn’t get much better than Audubon! Just after snapping these two photographs, a train thundered to the west of me. The Pintail took off, circled the pond and then headed south across the debacle that is the South West Ring Road, likely to the larger water body to the south. Grateful for this siting. 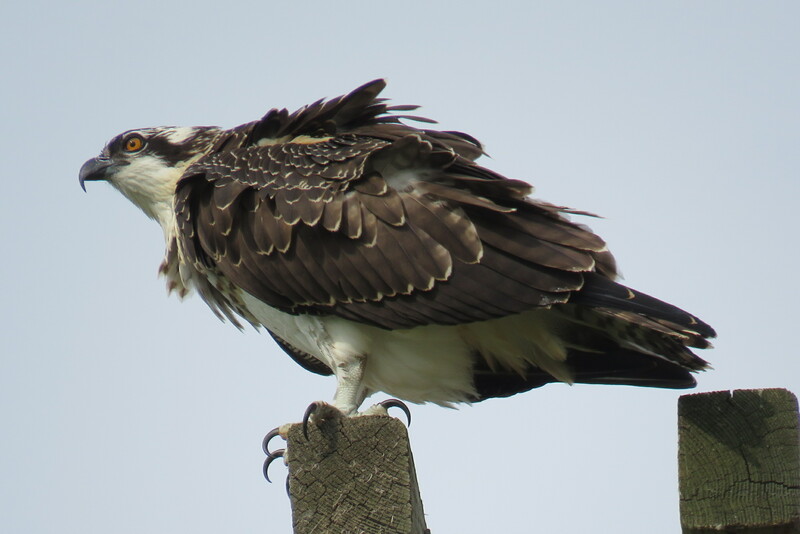 Being a Champion for Osprey! Of course! 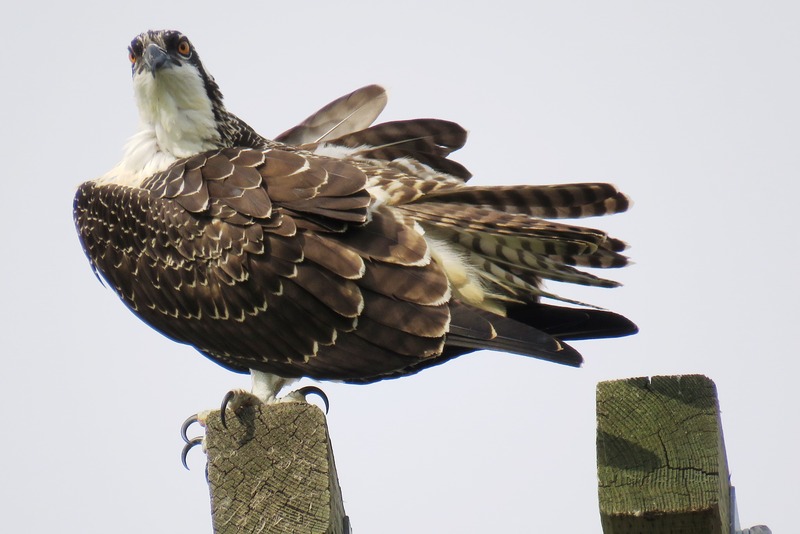 The Osprey are on my mind these days, so let’s see what Grade Three can pull off! 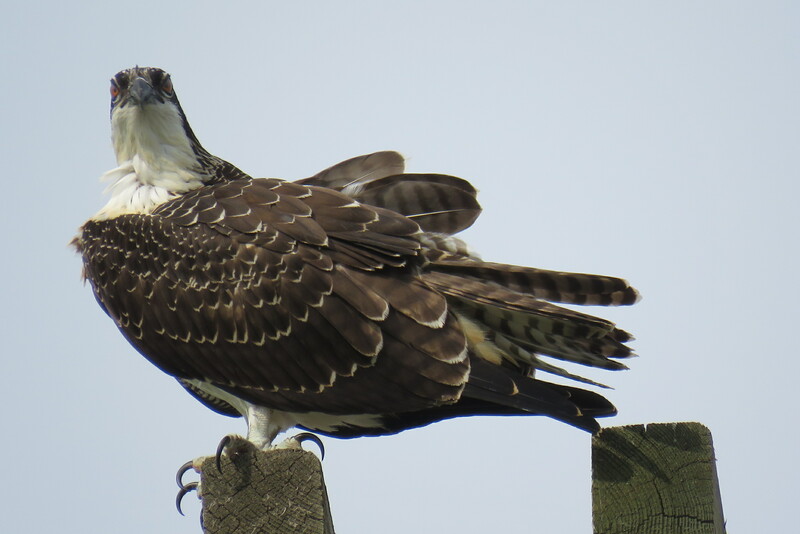 I shared, with the students, a few of my own photographs of Osprey. 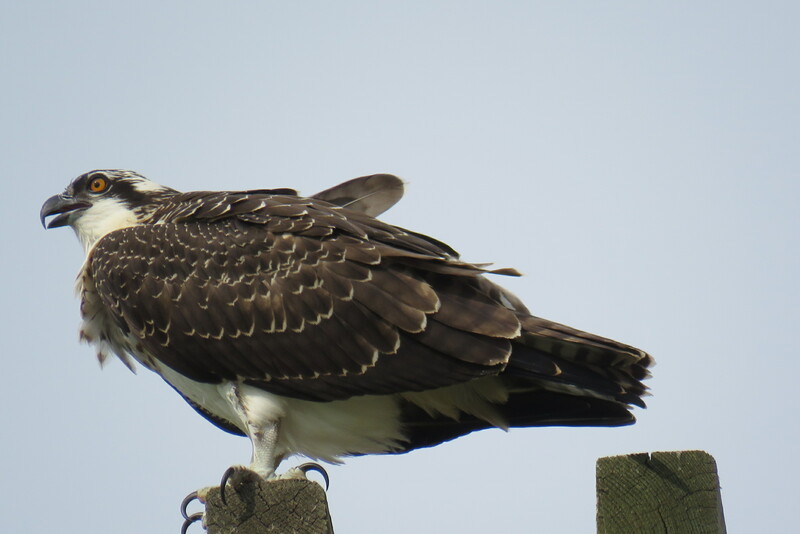 We talked about the similarities and differences between Eagles, Hawks and Osprey because, even adults, get them confused with one another. Earlier in the day, the students had discussed, with me, the aspects of a champion. I told them that I am a champion for nature and always will be. They told me stories about their champions and then went to their seats to write a couple of paragraphs about someone they consider to be a champion in their lives. 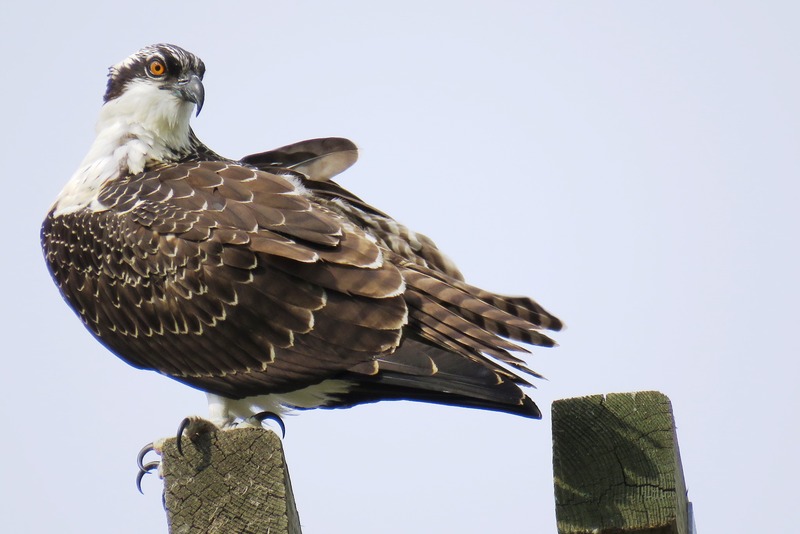 During art, we would be champions for nature, by talking for a while about how Enmax has built platforms throughout our city in order to help the Osprey out and to protect them. 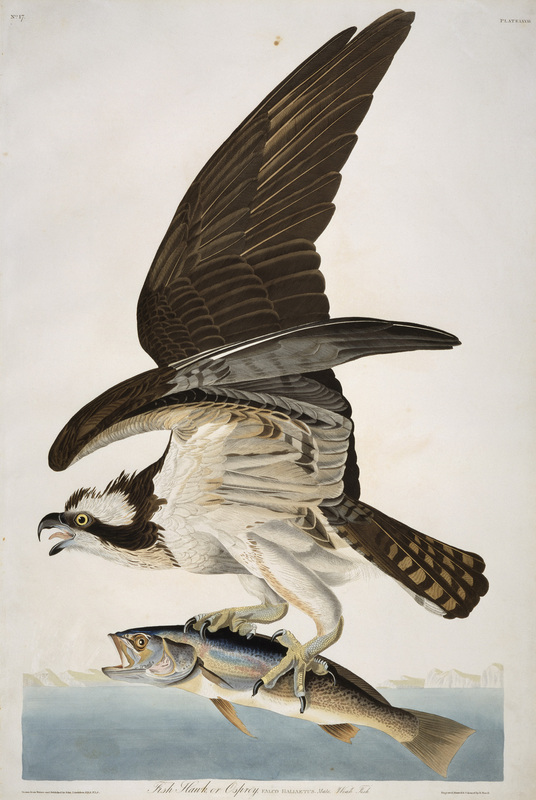 Then, the students would use their artistic practice to be champions, by making art that would teach others about the Osprey. David Allen Sibley is an American ornithologist. 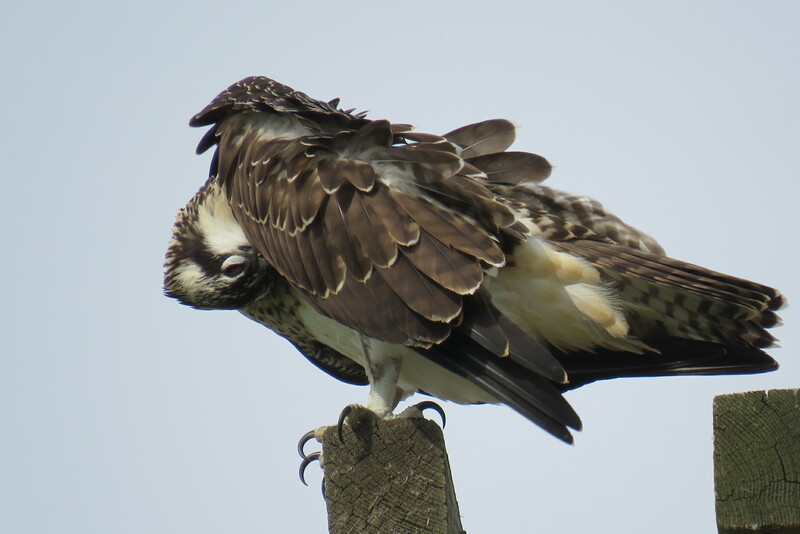 What better person to demonstrate some real basics of the form involved with drawing a profile view of an Osprey? The students made three sketches in their visual journals. YES! Three! Practice practice practice! If my readers want to see how challenging it is to draw the beaks, the form of the body and the head shape, try to draw along with David Sibley, here. While I wanted to do a small composition with the students in chalk pastel, I also wanted to prepare them. The practice was invaluable and the compositions ended up fantastic! I recommend that you put this video on silent as the music is very irritating…however, I wanted to give the students practice drawing the Osprey looking the other direction. Most chose to incorporate this posture for their composition and worked from their own drawings, as references. Here’s some of what the students accomplished. Thank you for your class, Jenn. The students were absorbed and determined as they produced their compositions. Having the practice under their belts, the chalk drawings took a little over 30 minutes…no pencil was used in the compositions. Students used white chalk to block in their simple contour lines to define where their Osprey would be placed in the composition. With a foundation of Reflection and Depiction, the students then had opportunity to Compose and Express, using the media. They learned to leave bits of the ground (green paper surface) exposed…to turn their chalk pastels onto their sides and on the tip, for different mark making. A very absorbed activity. When all was said and done, some of the students shared with me that when they were in Grade Two, I spent a class drawing Eagles with them. I showed them a Live Eagle Cam from Duke Farms. No eagles showed up to nest at Duke Farms this year. I think that it’s a very cool thing that some of these students have studied the Eagle and now, the Osprey. Show Grade Twos a Nest, And They’ll Draw It! The weather was brutal, as I headed to the pond with Max-man, something between pouring rain and snow, but not of the ‘flake’ variety. I thought that I sited 12 Goldeneyes, from a distance. Having left my camera in the car due to the weather conditions, I quickly began to have my regrets because the mating dances and the chases around the pond were so theatrical and even funny. Somewhere during the circle of the pond, I realized that the count was actually six male Common Mergansers, one female Merganser and three Goldeneye couples. So much brilliant white on the grey landscape! Absolutely stunning! Once I got Max settled back in the vehicle, I had to grab the camera and attempt some documentation. Unfortunately, the Mergansers were shy and were slightly out of my range for focus and the Goldeneyes, not much better. However, I’m posting a few here, as a matter of context. I had the most enjoyable time, literally laughing out loud. I feel overcome on behalf of the females for the intense circus they must negotiate at this time and the wild frenzied flights as they attempt to ward off aggressive males as much as they can. Things will only be more crazy over the coming weeks. There are so many pristine, clear photographs of these species on line that I’m almost embarrassed to post these, but heh, today I was caught up in the wonder of having experienced these birds and I’m grateful. I was late and when I arrived, I was kind of jostling and trying to find a spot to sit. The proper etiquette at Rumble House is to arrive in time to set up and when the artists are painting, yes, interact, but don’t blow the beautiful flow of painting and creating that is happening at the time. I was ‘the bull’. Thanks to Jess and Rich for helping me get sorted. I sat to paint, but had been filled with a bit of a melancholy all day. I never really know how it’s going to go. Do any of us? Presently, I’m listening to Vance Joy’s music on Youtube. It’s beautiful. Thanks, Jess. Two mamas have a little teeny son, August, and Jess woke at 4:00 a.m. with the sweetheart and listened to this. Such a beautiful song…and it leads to others. There is so much amazing joy in being engaged with life…but, there is also huge struggle. Yesterday, my cousin Jaime’s words of sadness and loss hit me very hard as well. The experiences that we are offered and challenged to face with grace and gratitude are limitless. Cayley has told me that I’m a bit of an empathic, so again, I feel a lot of this in my bones. I went out on my walk at Frank’s Flats yesterday early afternoon and the extreme variety of life experiences was exemplified in the glorious and the gut-wrenching pain to be found in nature. 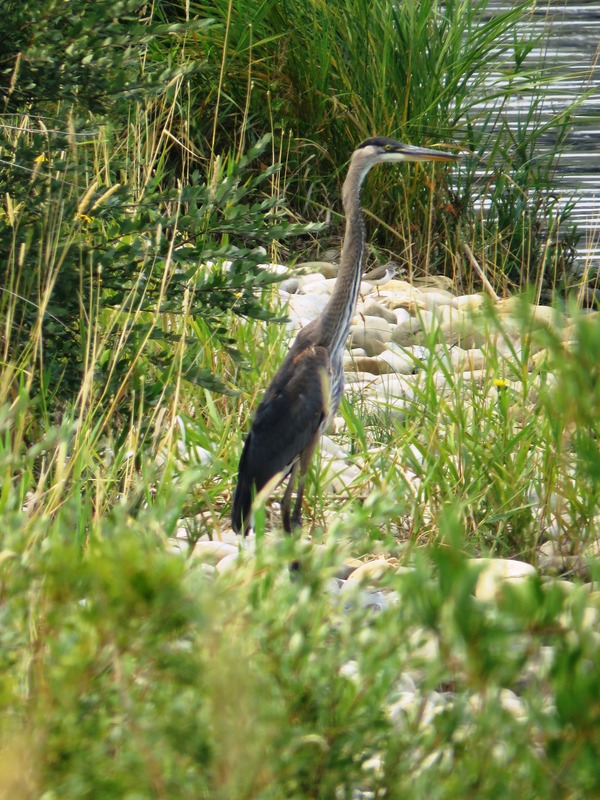 I stalked the great blue heron that had been perching for the past week or so at the pond’s edge…a very nervous bird who shifted its location at the sound of the train or a person walking the path some distance away…agitated…so powerful in flight…so truly amazing in its structure and appearance. Eventually, I grabbed some shots, not technically astute, but a testament to what I experience daily at the flats. This, just across the pond from a coot with a broken wing, trapped in the water some distance from shore. And…I came home and wrote this. Last night, I tackled a very small panel. I combined a feeling of the claustrophobic experience of grey skies blanketing the sun these last many days due to raging forest fires in Washington, Oregon…dangerously dry country, it seems, everywhere this summer and this bird raising up out of loss and injury and finding wings to fly. 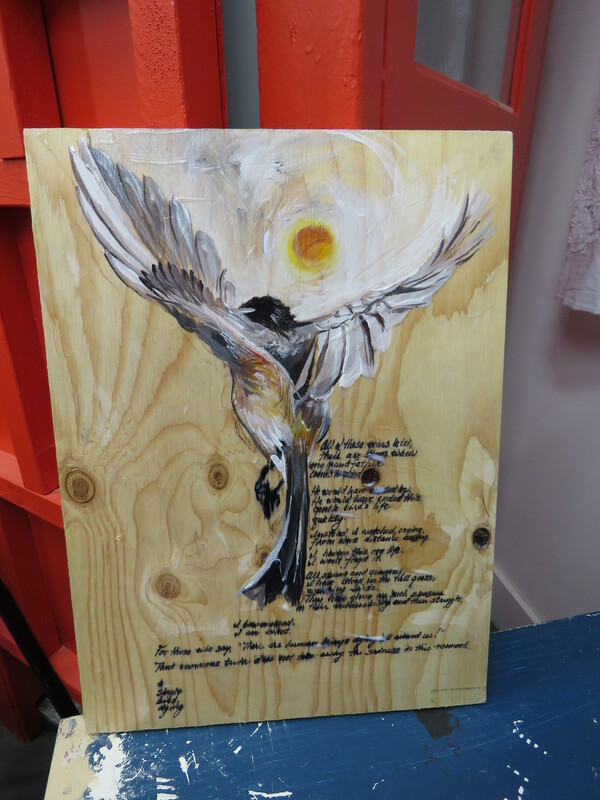 I made an effort to shift the consciousness and to honour the life energy of a single bird. 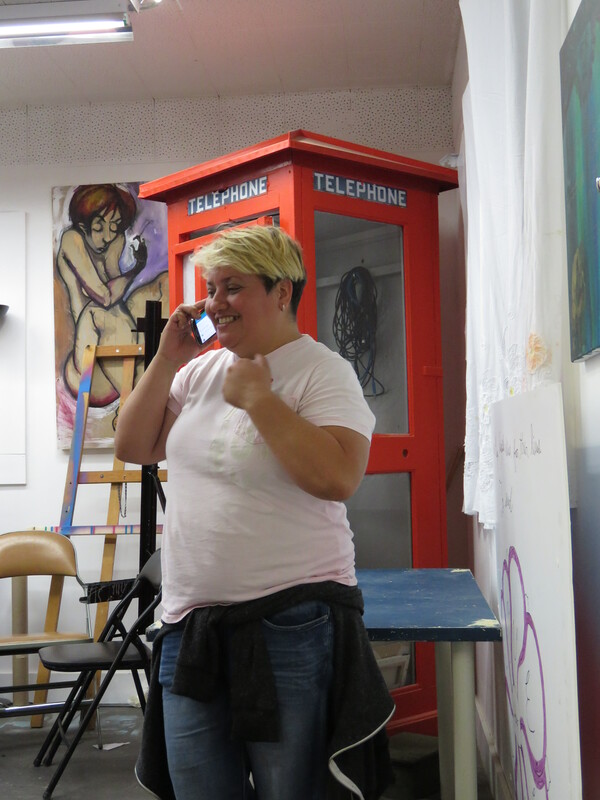 Congratulations to Jess Szabo on her exhibit of last night. I’m looking forward to Changing Face, featuring artists Daniel Audet, Amy Gaulin, Aaron Sidorenko, Rich Theroux, Nick Rooney, Brian Flynn, Doug Nhung, Ness Nelson and Shon Anderson. 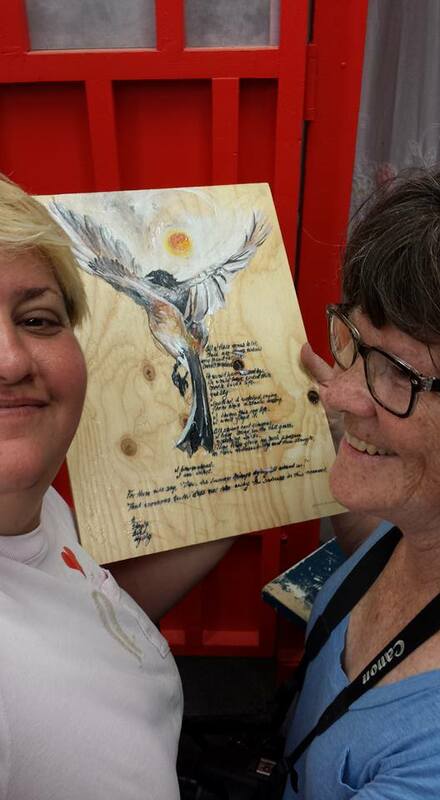 I was glad to have connected with Andrea, who took this bird home after auction. She has such enthusiasm and such an ability to project hope in otherwise hopeless situations. I love the energy of the people at Rumble House. Enriquito, my heart is for you on this journey. If I can give support, your Godmother-in-art is here for you. 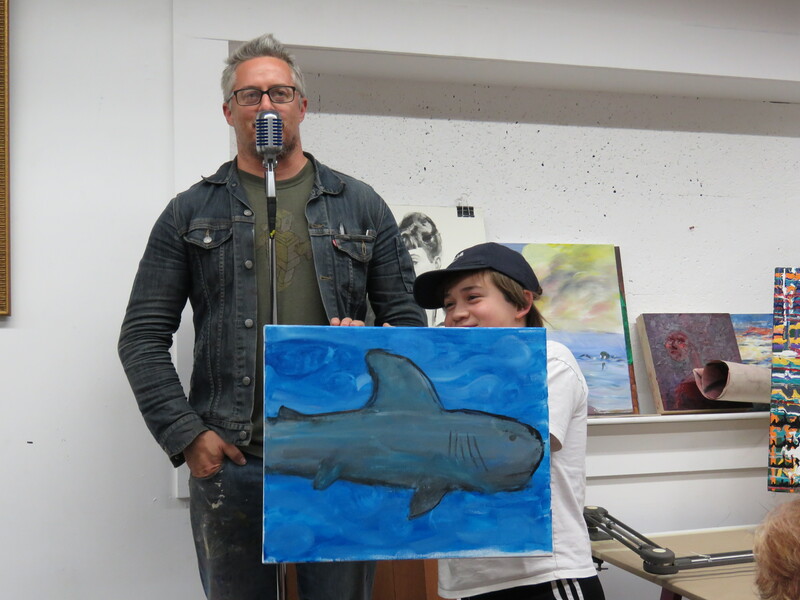 One of my favourite people tonight…Kai, featured here with his painting of Smudge the Shark. Feral cats roam free throughout the seasons on our circle. A few of them congregate on the ‘cat lady’s’ step because I think she gets them through the winter. One of the cats belongs to her, but he is definitely an outdoor cat. The other three come and go, but always sit, when she’s gone, on her smoking chair. The one that has managed through the most years is a tortoise shell long hair who often stalks my bird feeder and routinely catches and tortures mice. I watch, stunned, from the window. Yesterday, this very cat sat on the sidewalk directly across from my house…crouched and ready to bolt. Max, my dog, barked wildly from the living room window. I stepped outside to see what the commotion was all about. Looking carefully, I saw puffs of feather circling the cat’s mouth. 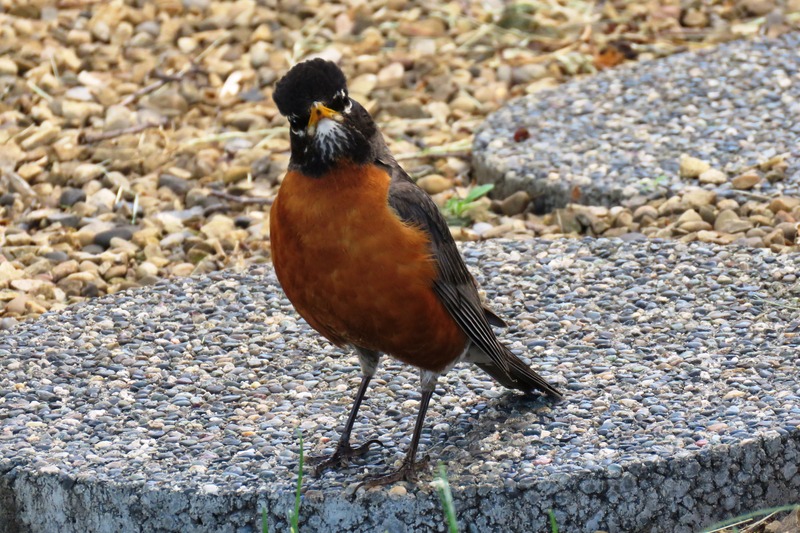 It looked funny until I saw the fledgling robin on the yard below me. Both mother and father were posturing anxiously in near proximity to the evidently scruffed up youngster. I shooed the cat away as it bolted and hid beneath one of the cars parked along the street. Bit by bit, I coaxed the young dude east along the street and up onto neighbour’s steps where he/she might be able to get some height on the next flight attempt. Prompted by its parents, it continued bob bob bobbing along, however exposed to the crows, the cats, the magpies and the great big world. 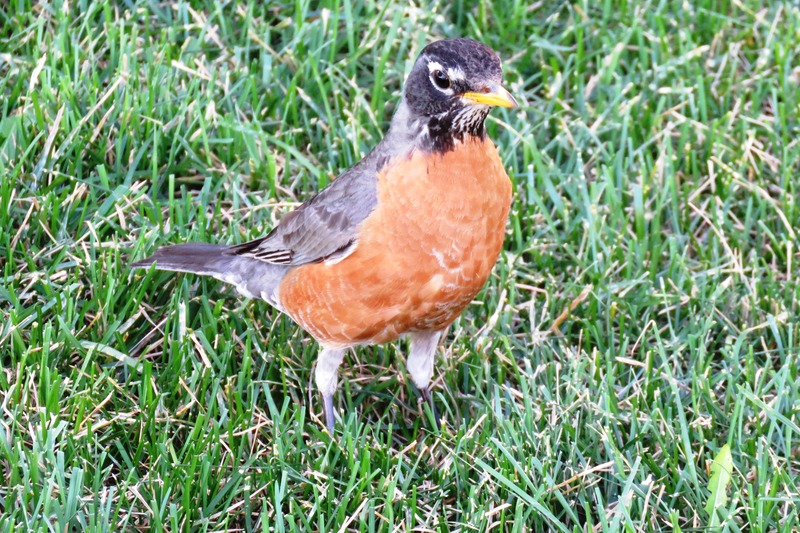 As I looked more closely at the young robin, I saw that it had been attacked on its chest and definitely on its tail feathers. I don’t know that it will at any point be able to fly, given this disastrous result. Once again, I contemplate the tough world of nature. I think about the challenges of adults, in this case, the hatching and feeding and raising up of young birds in precarious nests and then, teaching them to fly. In nature, there is so much fighting against birds, animals and plants. Sometimes I am amazed that species continue to populate this earth, where now, there are so many forces operating against them. Natural predators are one thing, but the forces that human beings exert upon species and the devastating development of natural environments is truly, staggering. 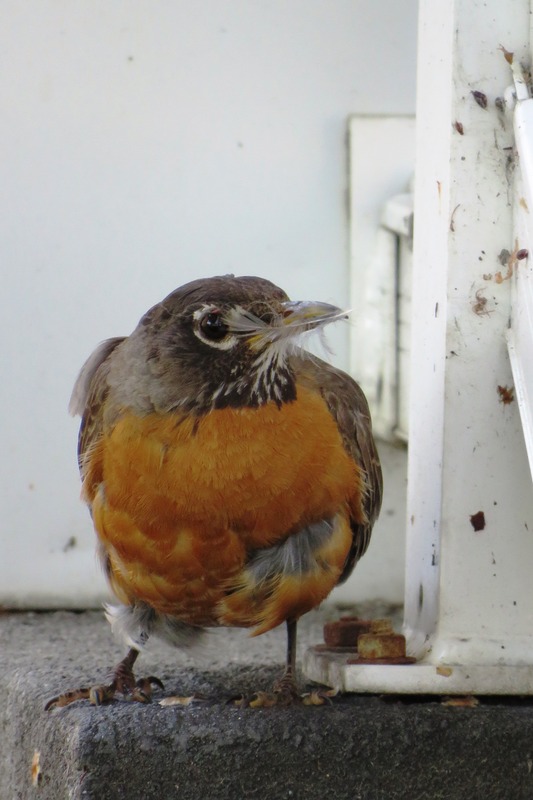 I managed, yesterday morning, to delay the violent ending of a young robin. The lesson, however, is that ‘out there’, it is the strong that survive. I guess it’s the same for us. ©Kathleen Moors Mama bob bobbing, frantically. Her antics, steering the cat’s attention away from her progeny. ©Kathleen Moors Dad, looking as puffed up and red-chested as possible, distracting predators, the cat and me, from his progeny. ©Kathleen Moors Youngster, his own feather caught within his beak, survivor of the first attack. I am spending quiet times at the pond, given that Max is injured. He’s at the end of the umbilical leash, quiet, but cranky about my dawdling at the pond’s edge and making only one circle of the water…stopping frequently to gaze at various species. I’m learning to use my camera bit by bit, but really have a lot to learn. Honestly, the most amazing things I’ve seen recently are rarely photographed because I’m either too slow or I really don’t care. I get wrapped up in the moment. I’m learning how much light has to do with photography. I always knew it…light and, more importantly, dark are essential to painting and the establishment of contrast, but to photography, even more so. I think there needs to be a degree of drama and also narrative in a good photograph. I dawdle so much because I’m looking for those sorts of stories. 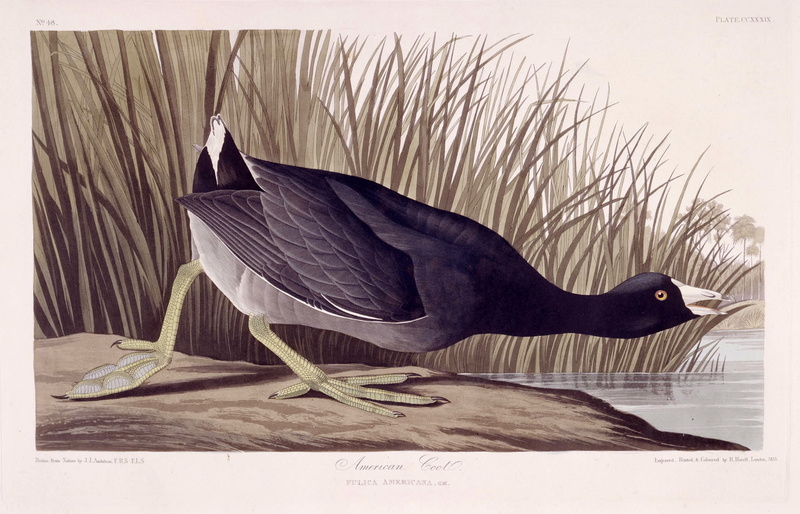 I’ve been watching the American Coots a lot lately, just because of the shear numbers of them at Frank’s Flats. 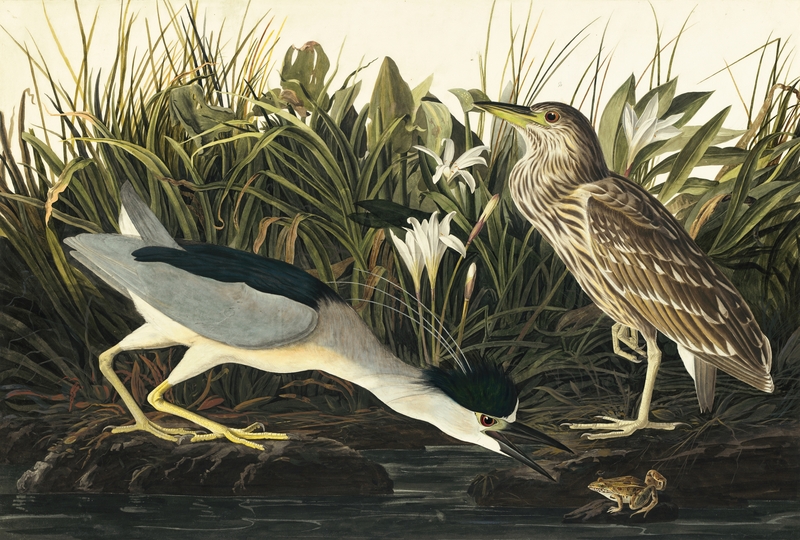 Here’s Audubon’s version offered up by the Toronto Public Library. I haven’t taken a single photograph of the coots, but I’m very caught up in the drama that surrounds these strangely disproportionate birds. They are constantly picking fights with other water fowl, same species or not. Wild chases erupt most times when they are around. Also, they get extremely amorous, sticking their beaks into the water and fanning out their rear feathers, all the while, shaking their butts. Most amazing, are their young! Long strings of eight, nine and ten ducklings following mamas and then day after day…fewer and fewer in number; likely good pickings for crows, magpies and other like-spirited birds. 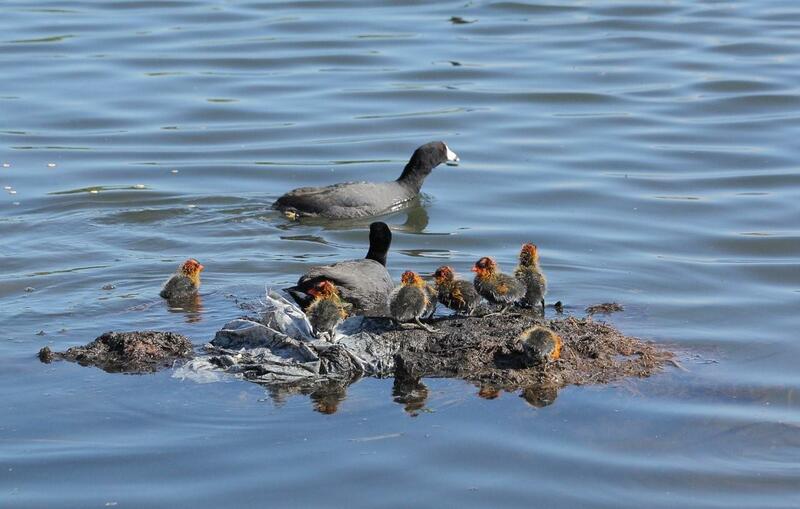 But the most amazing is the physical appearance of the baby coots! Rob English of Birds Calgary took this photograph in July of 2011. What’s NOT to love about these goofy red headed little guys? I don’t even know what these birds are called…just a sec…I’ll look. 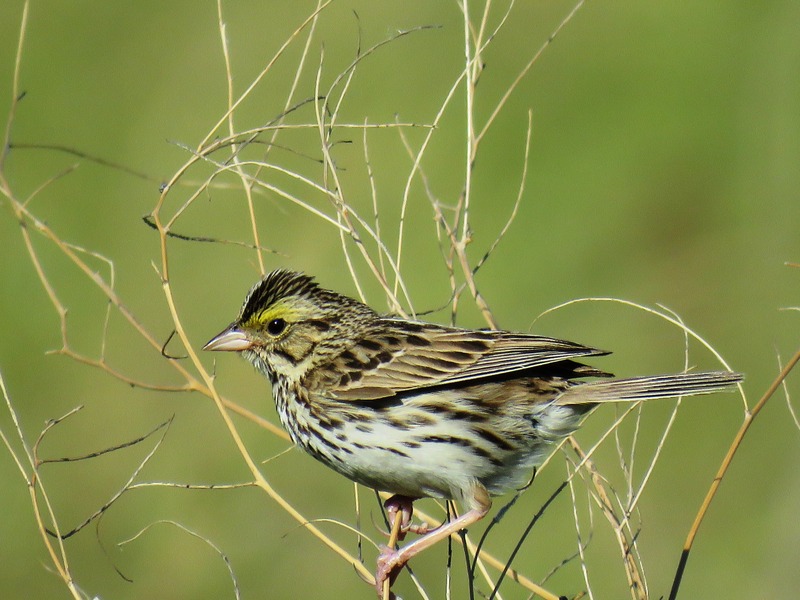 Uh huh…a Savannah Sparrow, or as Audubon would have us know it, a Savannah Finch. and…more animated, but perhaps less focused (and heck if I know). These are so petite and so delicate…it makes me wonder about the complexity of my Father-Jesus-Spirit God that these creatures are so ‘wonderfully’ made. 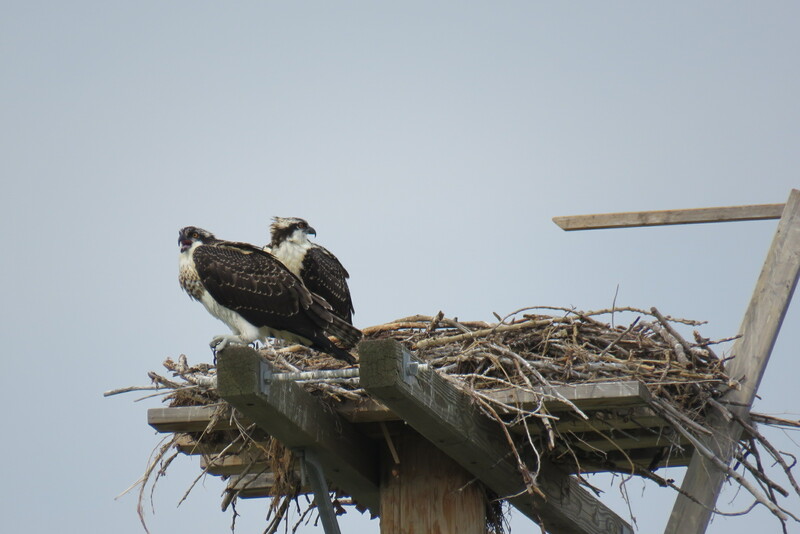 I checked in on Mr. and Mrs. Osprey. I have no idea how to accomplish a photograph of a bird in flight, but if ever there is one that should be properly captured flying, it is an osprey. The male has been such a diligent partner and I have seen him feed mama daily. I’m getting the feeling that she has wee ones because today her behaviour at the nest was very different. Or, perhaps she just found a fish dropped in front of her. Not certain. These photographs are always taken a great distance away and I’m not getting the best quality as a result. I find that photos early in the morning, while aiming west, are the best. 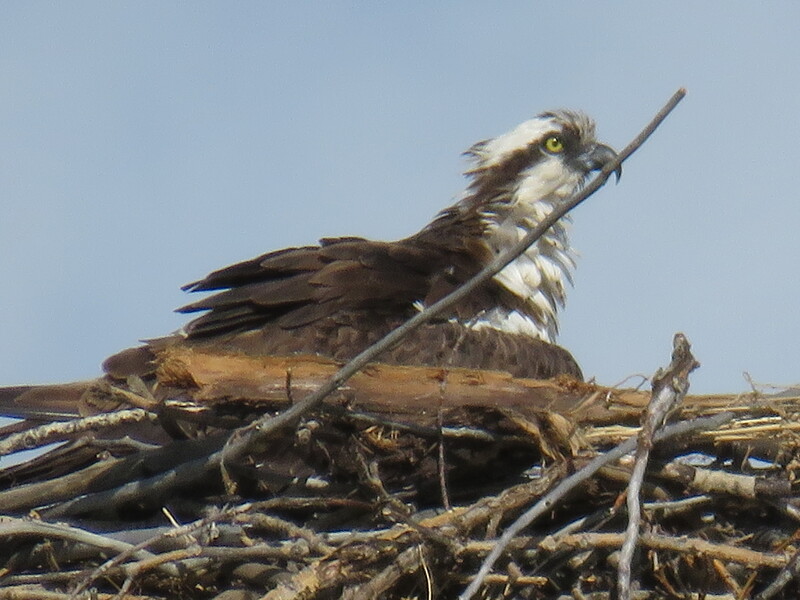 I’m so grateful that I have had opportunity to watch this nesting from the very first stick that was dragged across the width of all lanes on 22X. Dad was a long way off, but always faithful to his duties. Bare tree branches were filled with crows and magpies. They frequently hang out with him, as they like to have such a great fisherman as their very best friend. 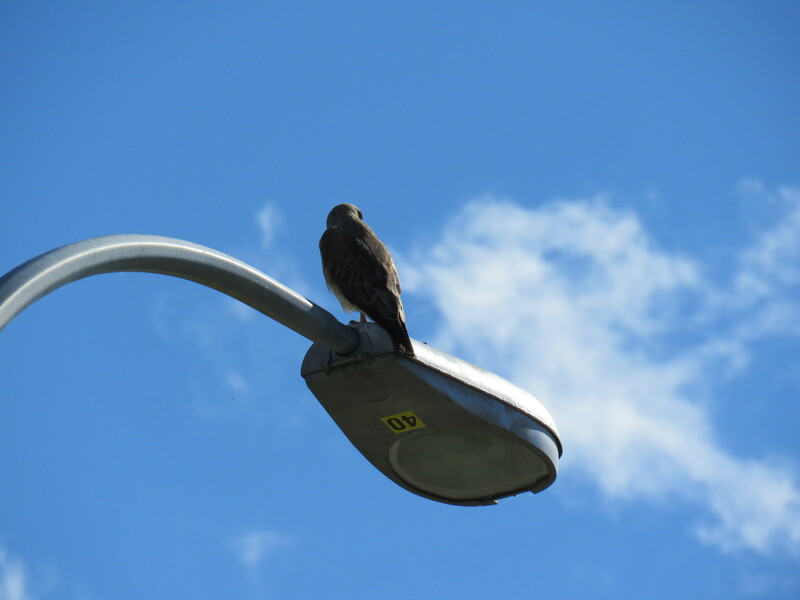 This guy…some type of hawk and his buddies find lamp posts to perch upon, no matter how busy the neighbouring road or high way. At a moment’s notice, they dive down and I’ve seen them carrying all sorts of rodents. He was marching about in the tall grass at one point. I’m not certain his specific variety, but I wouldn’t be messing with those talons, if I was a mouse. This character seems to have a thing for numbers. 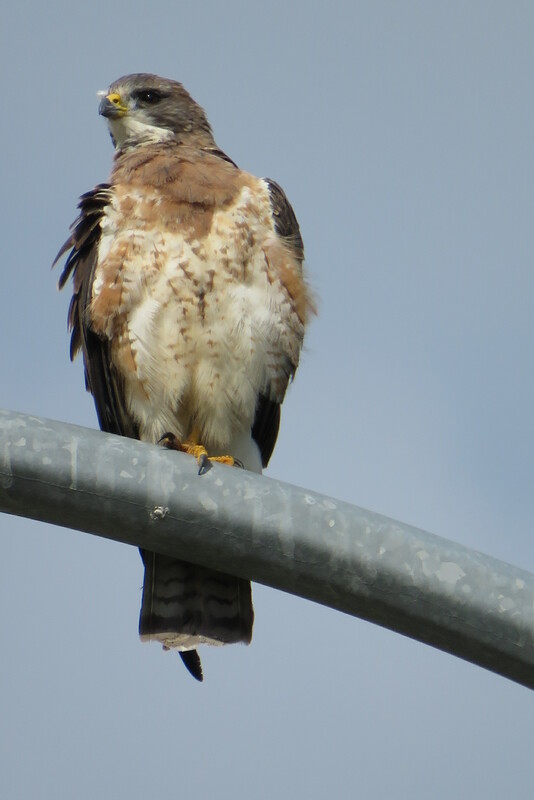 I think this may be a Harlan’s Red-Tailed Hawk, but my Dad will confirm once he checks out this post. 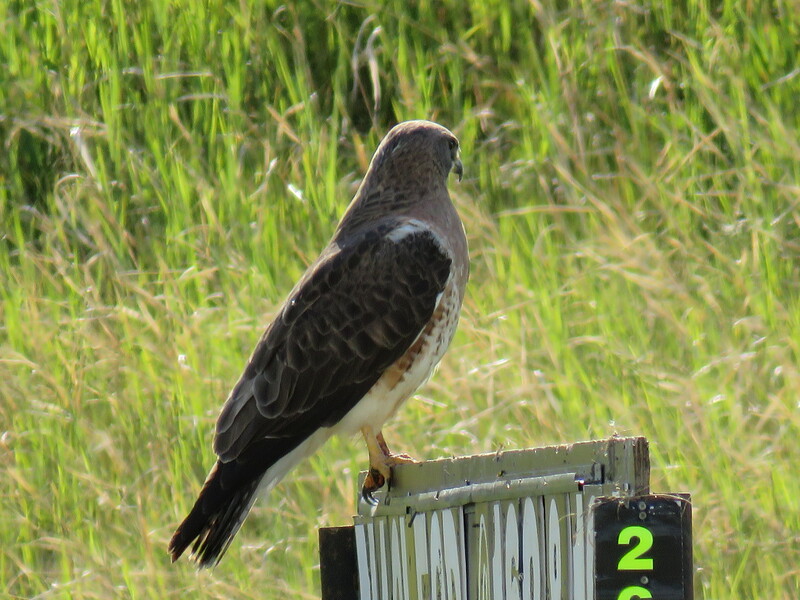 (Hmmm…thinking it’s a Swainson’s Hawk…YUPPER! Forget everything I said about a Red-Tailed Hawk!) 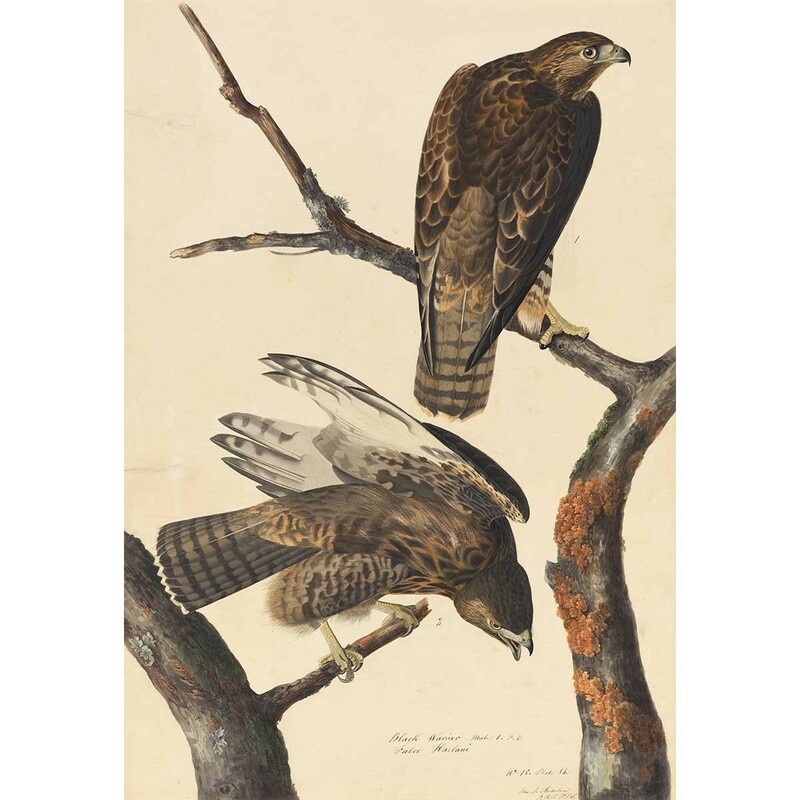 John James Audubon referred to the Swainson’s Hawk as being a Common Buzzard. I met up with this guy at one location and stood quite a distance away. His antics stepping in and around the water were fabulous, but of course, I was watching and not shooting. 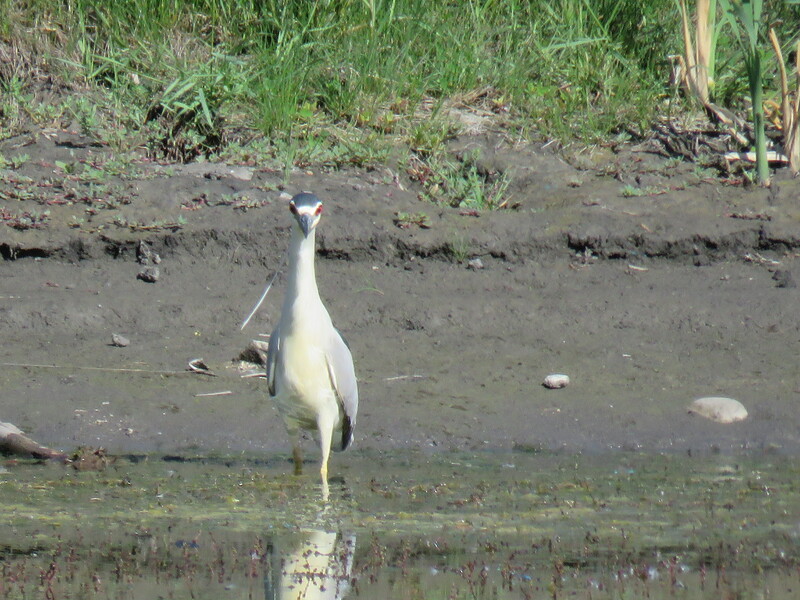 A very fuzzy capture of a Black Crowned Night Heron. In the meantime, in the neighbourhood, the magpies squawk at the feral cats…the sparrows continue their romance in the vent across from my kitchen window, the robins go bob bob bob along, tugging long worms out of the grass after every rainfall and one beautiful song bird visits a large back yard tree on the alley every morning. I delight in nature…in what grows. I am grateful that I am able to enjoy such wonders.